This versatile 7 function digital multimeter provides precise measurements and tests for a variety of electronics. 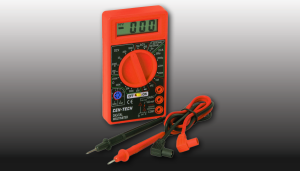 This multimeter tests AC/DC voltage, DC current, resistance, transistor and diode, battery test. Features an easy-to-read digital LCD display and automatic zero adjust.